This work provides high school and undergraduate students with a compelling and fascinating exploration of world customs and traditions. Comprising entries by anthropologists, religious leaders, scholars, dancers, musicians, historians, and artists from almost every continent in the world, this encyclopedia provides readers a truly global and multidisciplinary perspective. The entries explore the origins of the custom, explain how it was established as a tradition, and describe how and where it is practiced. 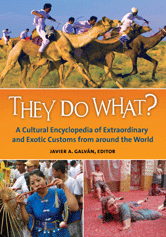 A thematic guide enables readers to look up entries by the type of tradition or custom, such as birth, coming of age, courtship and wedding, funeral, daily customs, holidays, and festivals.